Three different buildings have served as St. Margaret’s church since Fr. 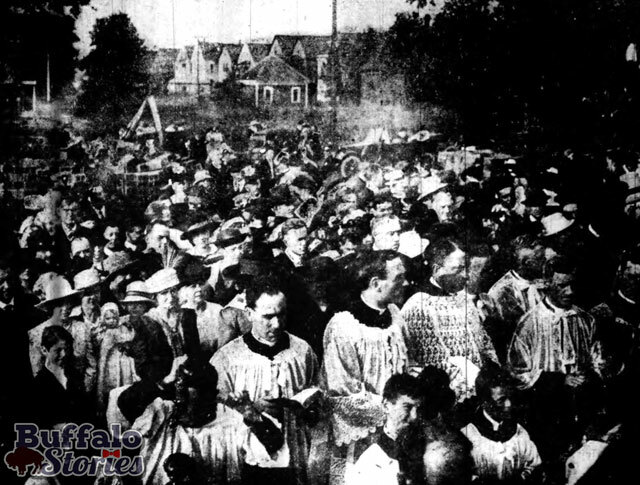 Thomas Timmons was assigned to start a parish on a swampy plot of land in the growing Hertel Avenue/North Park neighborhood in 1916. 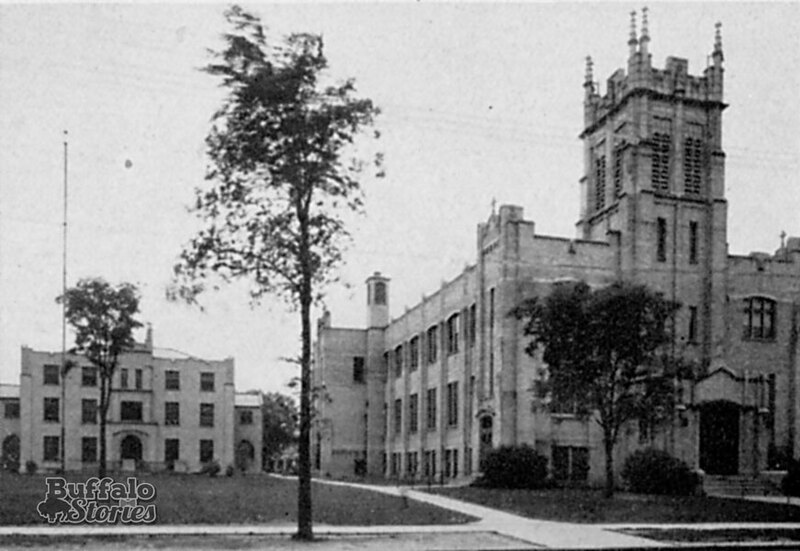 St. Margaret’s church and school, early 1930s. This building is currently under renovation into street-level retail and apartments. 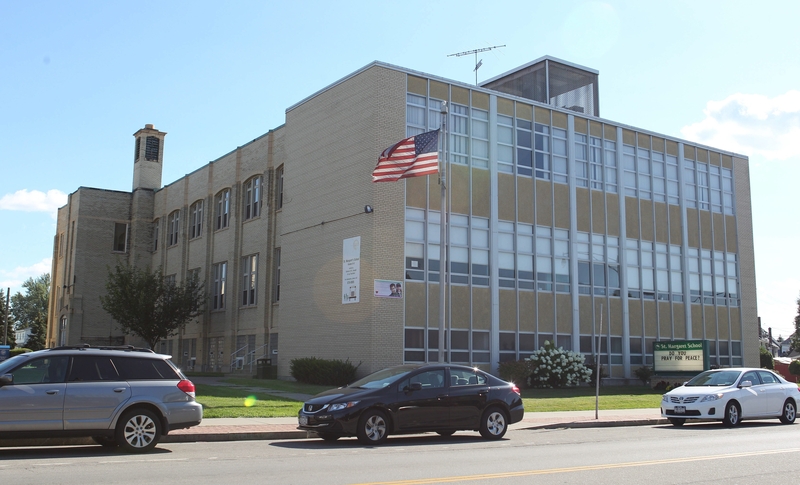 A façade was added to the building in the 1960s for the use of the school after the current St. Margaret’s church building was built in 1957. 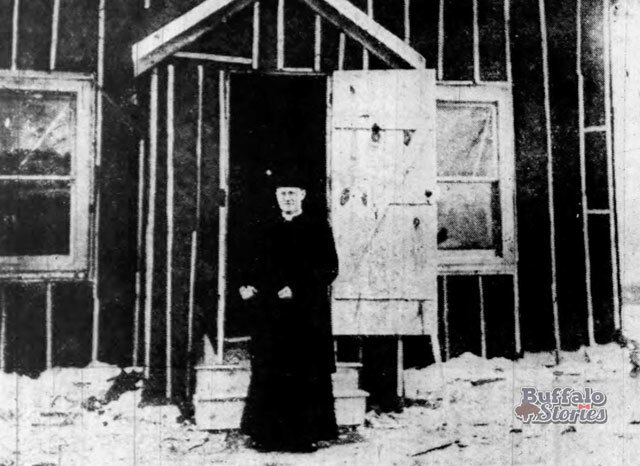 Early the following year, a temporary church was consecrated and open to serve the Catholics in North Buffalo. 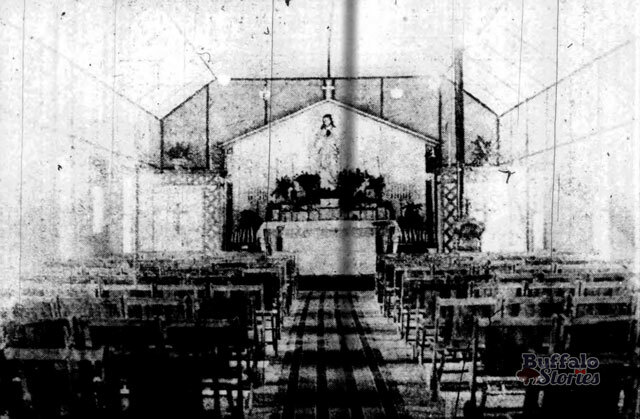 Interior of the temporary St. Margaret’s Church. 1917. Buffalo Stories archives. Within a year, the cornerstone was laid for the second St. Margaret’s Church. This is the building which was most recently St. Margaret’s School, and is currently under development by Iskalo to create 2,000 square feet of retail space and 24 apartments. The rectory was built in 1924, and the current St. Margaret’s church building was built starting in 1957. “The people of Buffalo are beautiful. 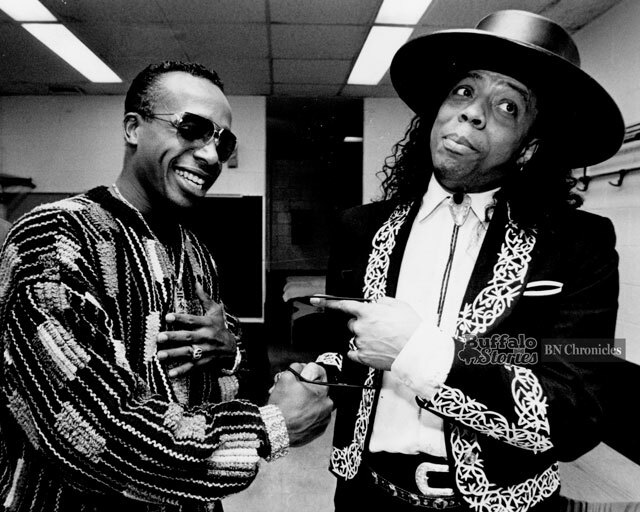 There’s a lot of talent here,” said Rick James upon his return here in 1977 to start a record distribution company. He told The News he left Buffalo not by choice, but because he’d been called to Vietnam with the Navy after missing too many reserves meetings. After a few more clashes with military brass, he fled to Toronto, where he formed the group “Mynah Bird” with Neil Young. Just as Motown was ready to release that group’s first album, the old Navy trouble resurfaced and James spent a year in prison. Young split to join Buffalo Springfield, and the future Super Freak went to work writing and producing for Motown. 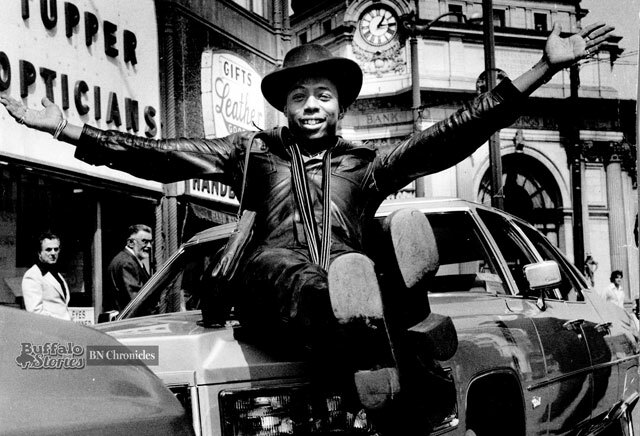 After several well-received singles, James’ 1981 release “Super Freak” made him a world-renowned funk star. The rocker returned to Buffalo again in 1997, this time shooting a “Behind the Scenes” documentary for VH-1. He hadn’t been back to Buffalo in six years. Three of those years away were spent in prison. James told News reporter Anthony Violanti that the years in prison were the first of his life that he tried to clean up, dry out and grow up. A reflective James said he could never move back to Buffalo or his Orchard Park home — the memories were too painful. He did visit School 53, the Masten Boys Club and Masten High School — though school officials demurred on the chance for James to meet with students. 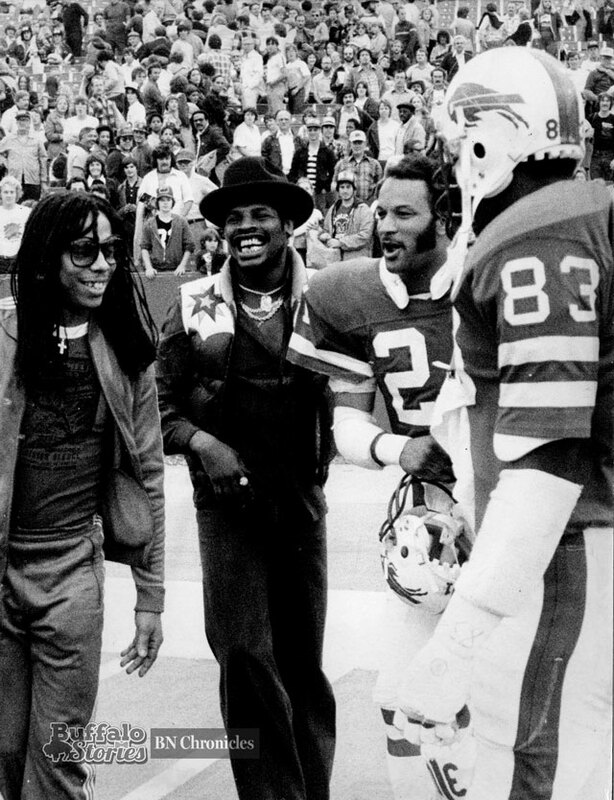 “It’s a great town,” James said of Buffalo, “but it’s a strange place.” He said there was nowhere else that had more influence on his music than his hometown. Seven years before he died of heart failure, he had one wish for the city. 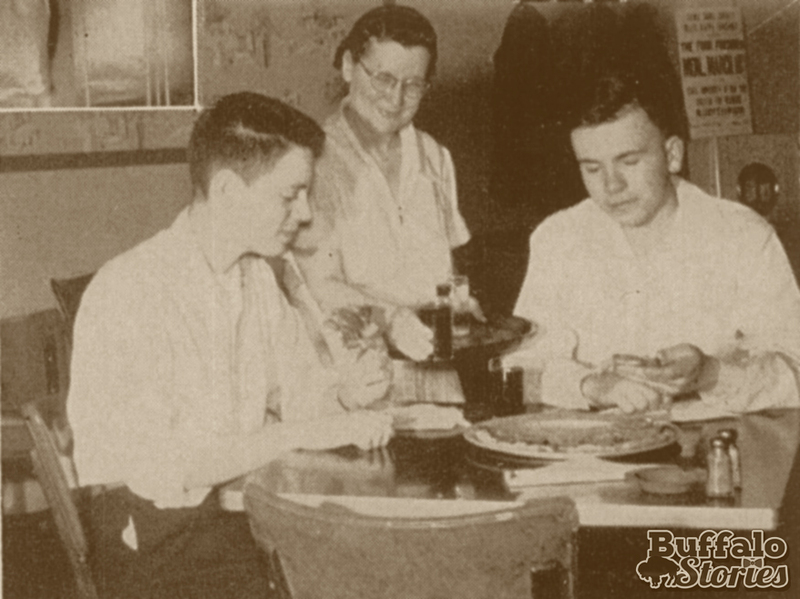 Anne Bunis started the Sample Shop in the front parlor of her Hertel Avenue home in 1929. Soon after, her husband, Louis, had the idea to have “living mannequins” in the front window. What had been static displays had become fashion shows for passersby on Hertel. That one house grew into a string of five houses within a decade. 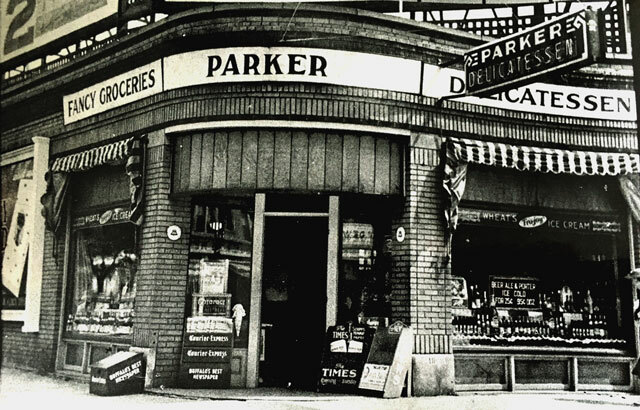 In 1947, the houses were torn down and the long familiar Sample store was built. 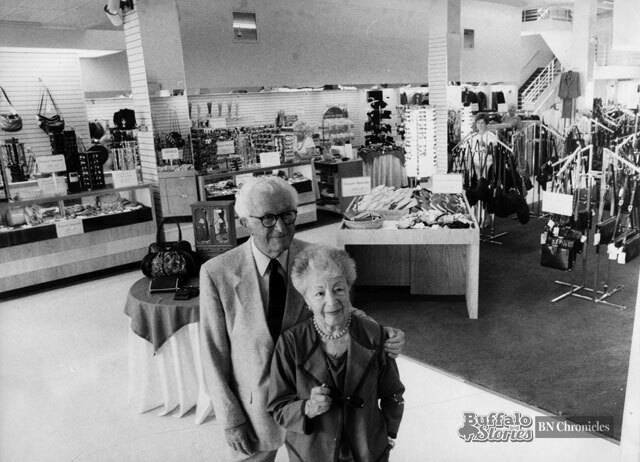 In 1989, as 88-year-old Anne Bunis watched her company open a store in the Walden Galleria and even as the cake was being cut in celebration of the Sample’s 60th anniversary, the end was in sight. The 11-store chain dwindled to three, and those remaining Sample stores were ordered closed by a bankruptcy judge in 1990. 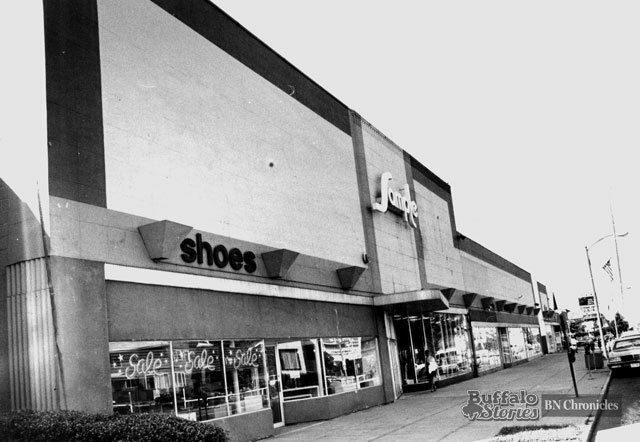 In 1993, the flagship store on Hertel Avenue was razed to make room for a senior apartment complex. As noted in a 1990 editorial, the loss of the Sample to Hertel was as big a blow to the neighborhood as the loss of Sattler’s was to Broadway-Fillmore. Unless you lived in a time when Hertel and Colvin still looked like this, there are very few clues to orient yourself to this view in 2016. 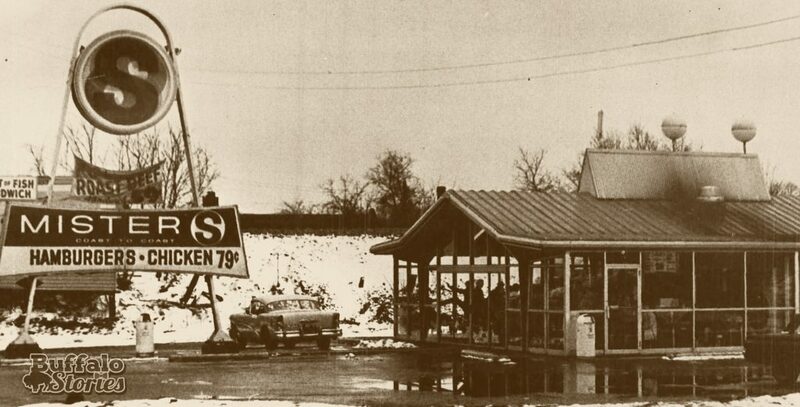 The buildings in the immediate foreground have been replaced by the Sunoco gas station. The first building still standing is the old post office. The current Gabel’s building is also easily identifiable on the next block up at Crestwood Avenue. Some of the signs can be made out on the businesses, others can’t, but the listing from the 1959 City Directory offers some explanation. The odd side of the street is shown. 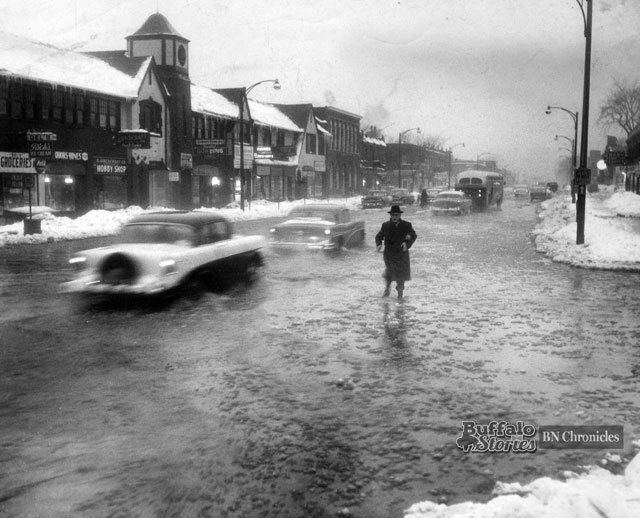 The photo was taken as an icy January was hit by a wind storm bringing warmer air and flood waters to much of Western New York. 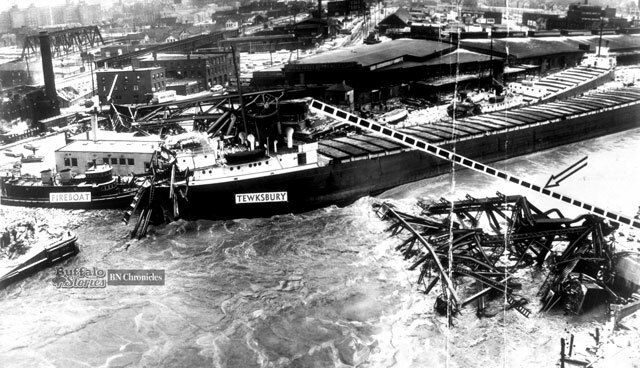 It was during this same week that the SS Michael Tewksbury slammed into the Michigan Avenue bridge after winds blew it away from its moorings. The 20-year-old lift bridge in the shadow of the General Mills plant was completely destroyed. The gale and flash floods left millions of dollars of damage, with South Buffalo and Lackawanna hard hit. Six feet of water filled the Republic Steel plant on South Park Avenue, and the shutdown of the two blast furnaces and nine open hearths made costs climb into the millions alone. 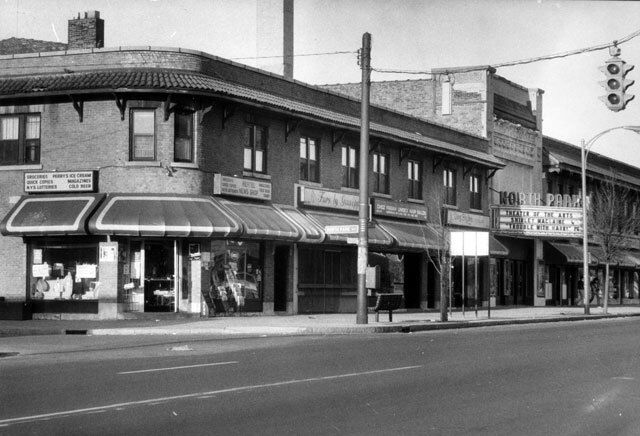 Nominally, he ran Sharkey’s Smoke Shop at Eagle and Washington, and later Bison Toy & Novelty on North Division Street as a small businessman. 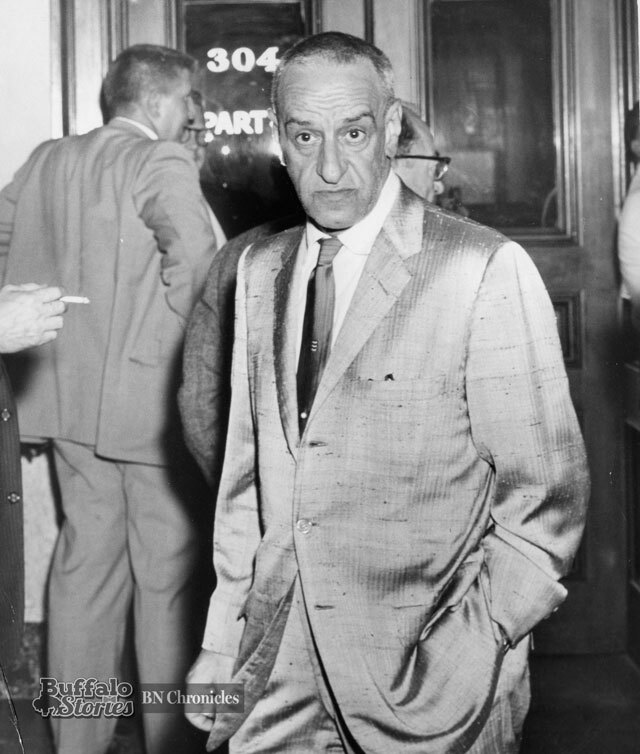 He later admitted to the State Crime Commission that he’d been using those places as a front to take bets since the early 1940s. The toy store made about $3,000 a year. Bookmaking was taking in $4,000 a weekend. 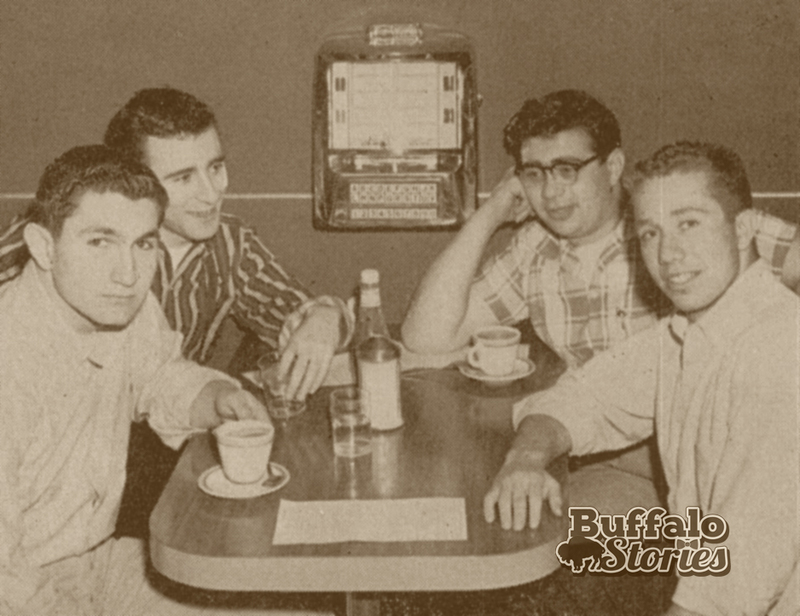 It wasn’t that Jack “Sharkey” Ehrenreich was a bookie that made him such an interesting character in the fabric of Buffalo life in the ’50s and ’60s, it was his grandiose style which made it all so memorable. When he was accused of having help staying in business from inside the police department, Sharkey told his state questioners that he was good at “out drifting” the police. “When I see the (police) car, I just move onto the next block,” he testified in 1960. That was partially true in that he did leave his home base of Buffalo for Hamburg. Buffalo News wordsmith Ray Hill called it “the highlight of his betting career,” when, in 1954, Buffalo Raceway banished Sharkey from the track because the book he was running there was putting a sizable dent in the take at the track’s own parimutuel betting windows. The law caught up with him a few times. In 1947, he was arrested amidst five telephones and baseball betting slips. Charges of taking bets on horses were dropped in 1950. A year later, police assigned a patrolman to stand guard outside Sharkey’s cigar store to make sure recently disappeared trappings of betting — like a giant chalkboard with constantly updated baseball scores and stats — didn’t reappear. A family man and a good guy around town, Sharkey Ehrenreich was the sort of colorful figure who used to live in everyone’s neighborhood, and added to the variety and vibrancy of life in our city, even if from just on the other side of the law. But just how terrible was the crime he was committing? In our day and age, instead of a guy like Sharkey — with one eye on ball scores and another for approaching cops — hanging out at a cigar shop or by a corner payphone, these days Buffalonians with a basic yearning for action can now enjoy scratch-offs and Quick Draw, fully legalized and institutionalized by the New York State Lottery. Just like with Sharkey, all you need is a dollar and a dream. Over the last 10 to 15 years, Hertel Avenue has cemented a reputation as the slightly less-crazy-but-still-just-as-fun older brother of the Elmwood strip. Spending an afternoon or evening on Hertel drops you in the center of the cosmopolitan “New Buffalo,” showcasing a perfect example of a diverse neighborhood that has retained the flavor and feel of its heritage, keeping bits of the old while the vibrant and new evolves. The result is a strong, proud, urban neighborhood filled with residents and entrepreneurs of every age and experience — all combining to reflect the best of our uniquely Buffalo character. While history is certainly a part of the mosaic that is the Hertel Strip, the street’s great vibe doesn’t rely on cheap nostalgia. Longtime venerable institutions have been rebuilt and reconfigured to fit our modern needs and make the past a living, breathing part of what’s next. 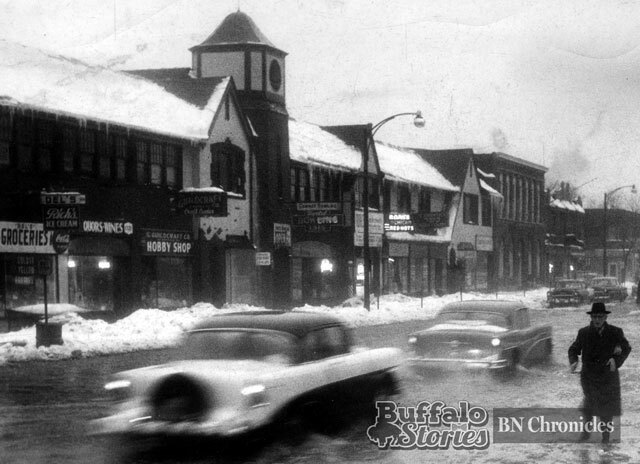 Here, in the first of a biweekly series about the history of our city that the citizens of Western New York should know, Chronicles takes a look at what makes Hertel Avenue special. 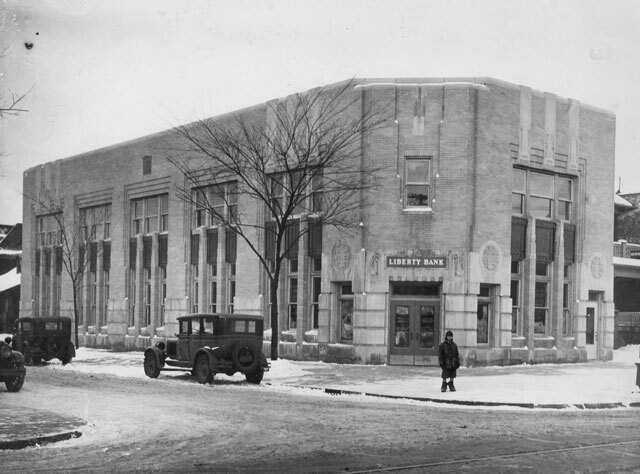 The most obvious and stunning example of Hertel Avenue’s renaissance is the North Park Theatre, built by Buffalo movie house magnate Michael Shea as Shea’s North Park when the neighborhood was new. 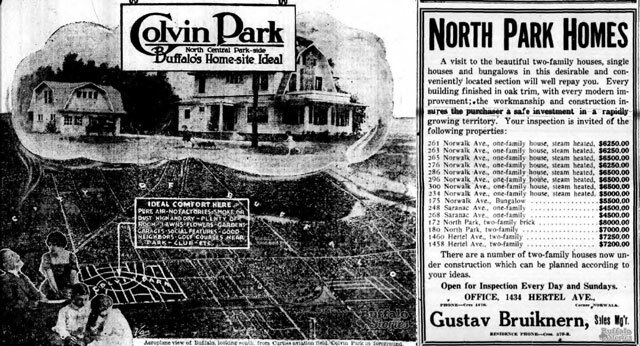 As the cinema opened in 1920, you could still pick a plot of land and have a house built to your specifications on many of Hertel’s side streets. 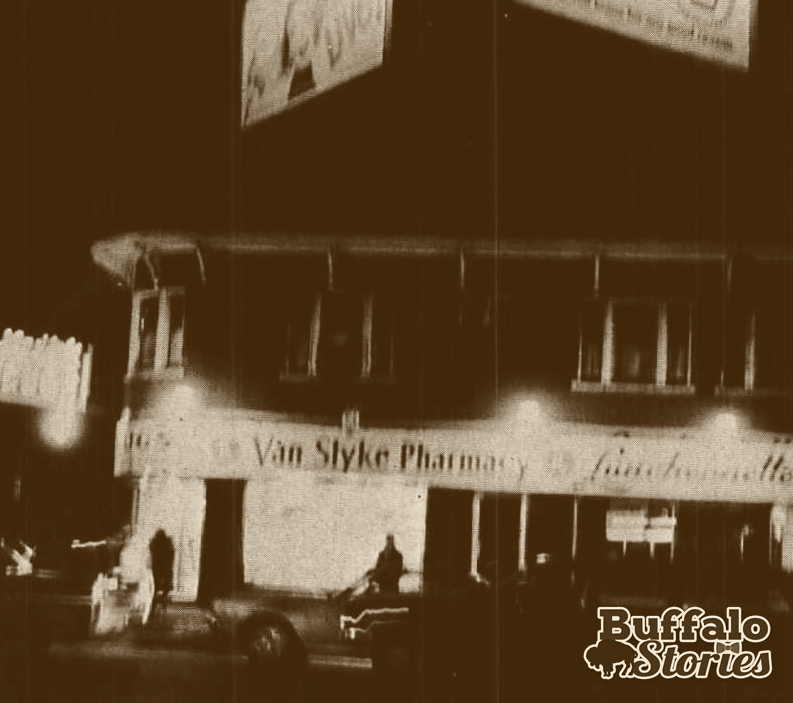 The bright lights of the North Park have shined through plenty of history — bright during Buffalo’s Golden Age, they were still lit as “the last person to leave Buffalo” was asked to turn out the lights by the famous downtown billboard in the late ’70s. The theater was there for neighborhood kids to spend their spare nickels and their entire Saturdays watching Tarzan and Popeye. Later, after those kids started spending Saturdays at home in front of their own screens, the theater was there showing dirty movies. As an institution, the single-screen “neighborhood show” was decimated by the 1980s, but the North Park hung on. In the ’90s, the North Park was the last man standing, showing mostly foreign and art films, until the digital age caught up with the dinosaur. 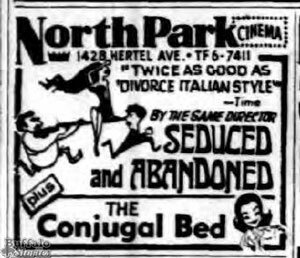 The North Park was open for business before talkies in an era when films didn’t even have sound. It seemed financially implausible to update the old house with the cinematic workings of the 21st century, but somehow, unlike dozens of other community movie theaters, the North Park lived on to become the focal point of the renaissance of a neighborhood and a city. 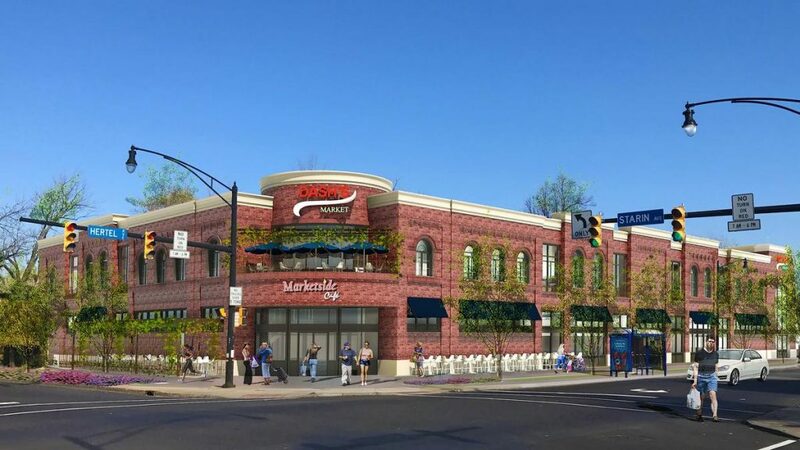 The millions of dollars pumped into the landmark excited an already-burgeoning scene on Hertel, doing what Buffalo seems to do best — using our history as a foundation for our future. The North Park hung on long enough to become an anachronism worth saving, but that wasn’t the case at the home of Hertel’s other famous neon sign. When Jack Shapiro served his last pastrami on rye with a side of gruff and slightly agitated at his beloved Mastman’s in 2005, an era ended as the city’s last kosher deli closed. It followed a handful of other institutions that had been a part of the vibrant Jewish community on Hertel. 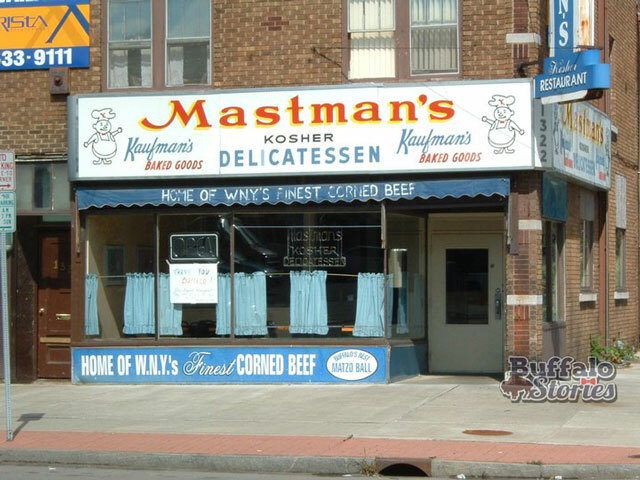 When Shapiro bought Mastman’s in the late 1970s, the matzo ball competition with other delis — like the vaunted Ralph’s — was fierce. 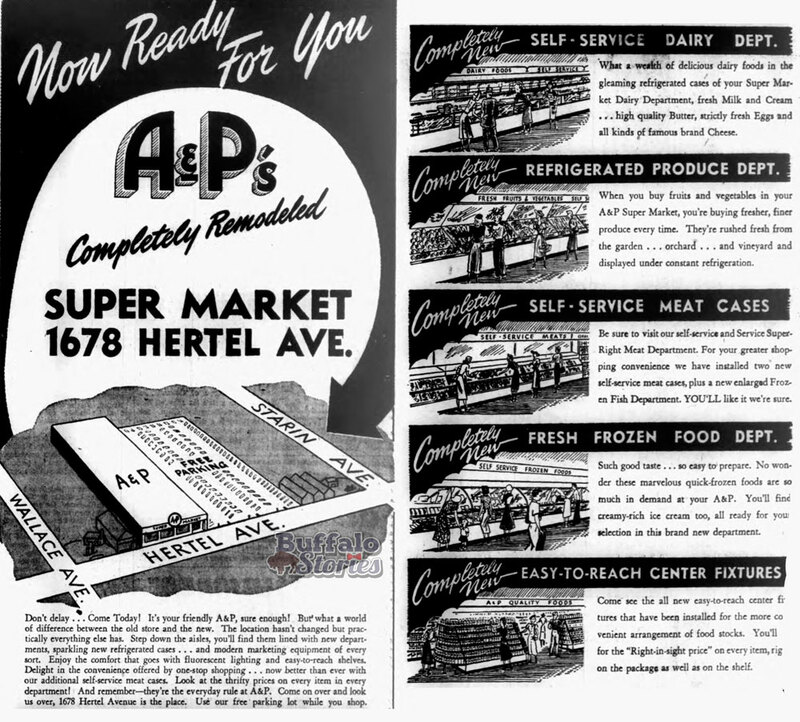 Go back to when Max Mastman opened his door at Hertel and Colvin in 1945, and there was even more competition — even from the family of CNN’s Wolf Blitzer, which owned Blitzer’s Delicatessen in the storefront that later became Ralph’s. Of course, it wasn’t just the delis or the synagogues that eventually left — it was the people who populated them. 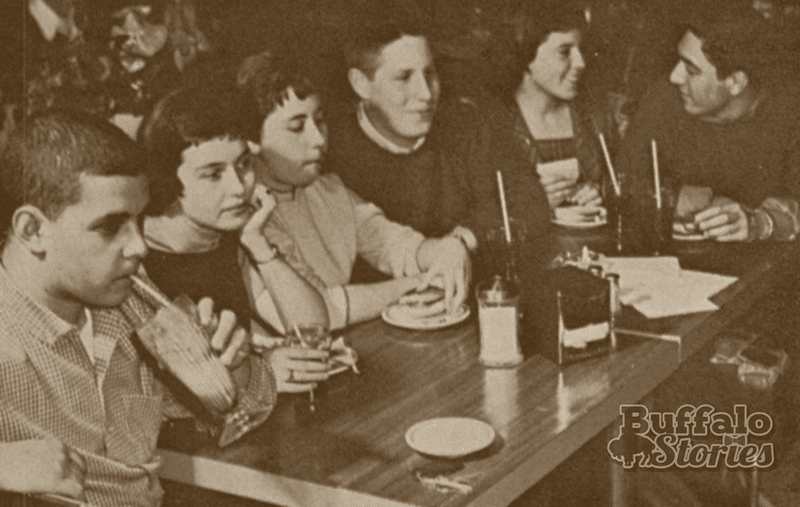 The epicenter of Buffalo’s Jewish culture, which had moved from William Street on Buffalo’s East Side in the ’20s and ’30s to Hertel, moved on to Amherst in the ’50s and ’60s. 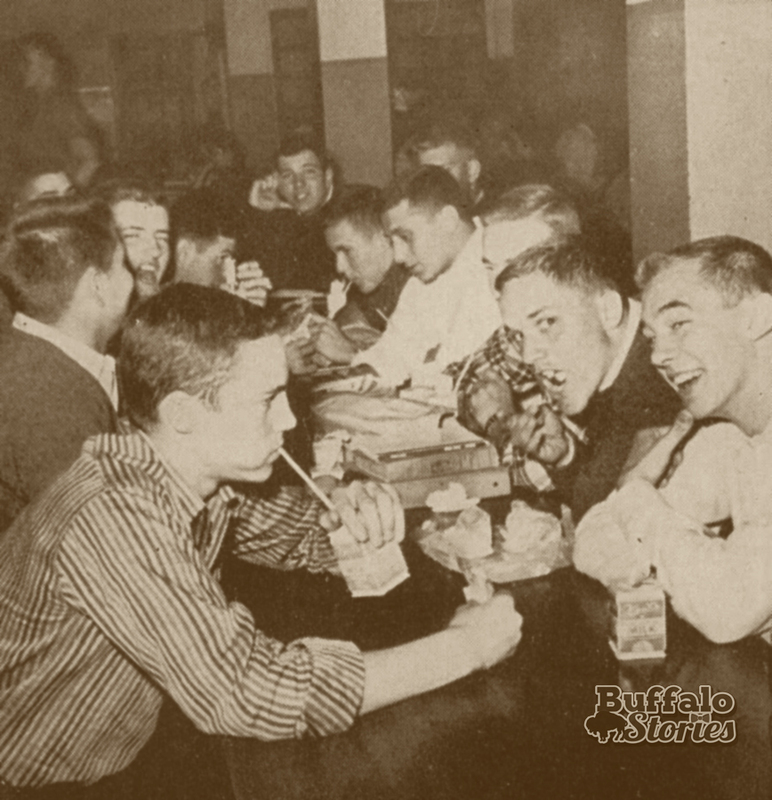 Meanwhile, larger and larger segments of Buffalo’s Italian population began drifting north from West Side Catholic parishes to North Buffalo’s Holy Spirit, St. Margaret’s and St. Rose of Lima. It was back on the West Side on Connecticut Street where a group of proud Italians tried to revive the old traditions of the St. Anthony’s festival in the mid-1970s. They succeeded, reviving it to the point where “The Italian Festival” outgrew Connecticut Street. 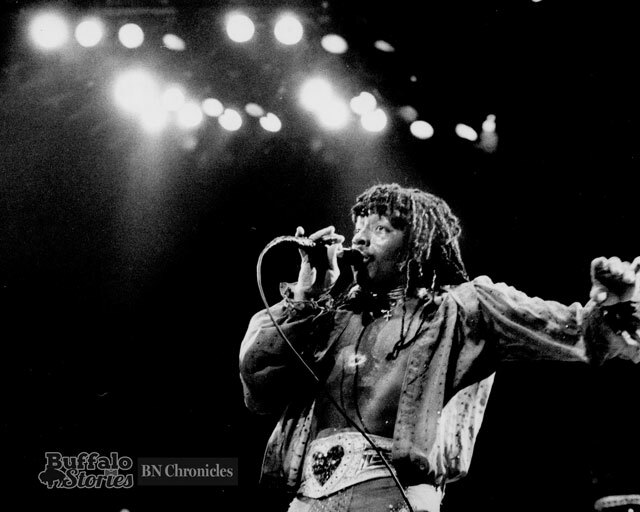 It expanded even further once it hit Hertel in 1989, and it was in North Buffalo where the festival became a regional event. Part of Hertel’s modern-day appeal is the nightlife, and the handful of taverns, gin mills and night spots where patrons have the feeling like they could run into just about anyone who is in Buffalo and looking for a good time. Along Hertel in the 1970s, one place in particular had that feel, and that place was was where the powerful and elite went to have a good time: Mulligan’s. 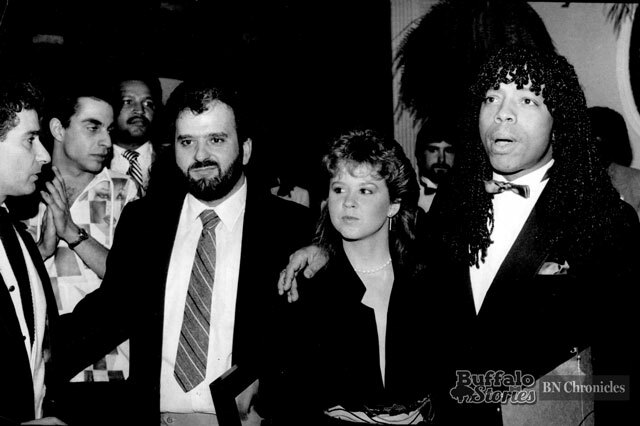 Mulligan’s was the regular night-out home of Buffalo’s great stars, such as OJ Simpson, and Buffalo’s great visitors, such as Cher. 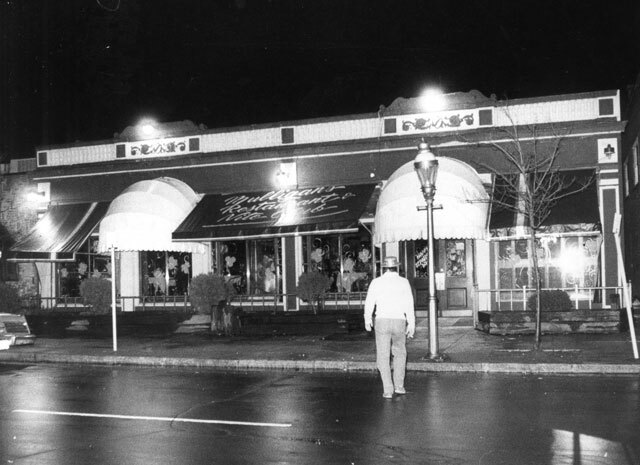 Mulligan’s was even the scene of an underworld execution: Career burglar Frank D’Angelo was ambushed and shot dead leaving Mulligan’s on Oct. 5, 1974. It’s long been assumed he was killed after not offering mob bosses their expected portion of the profits after a big jewelry heist. 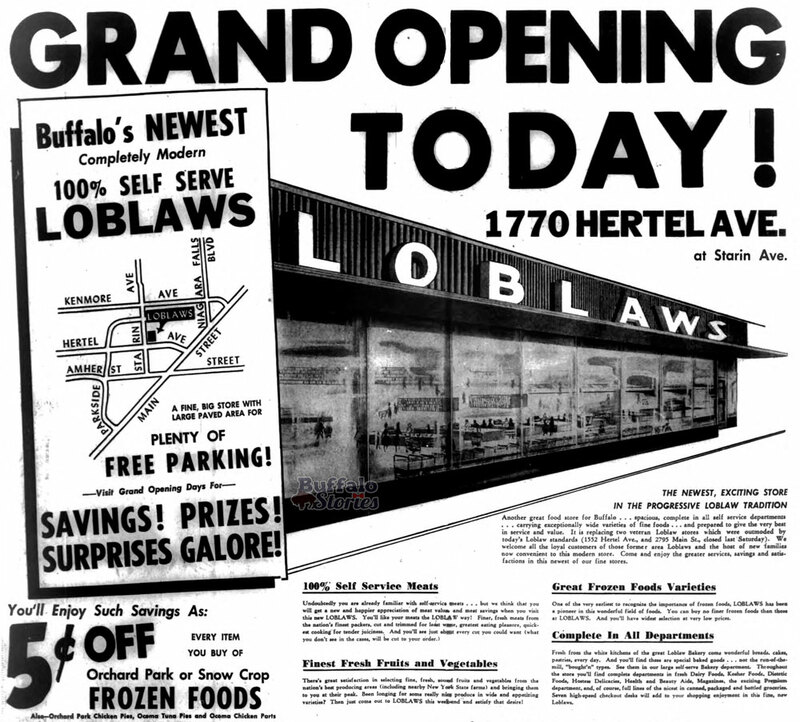 The 1970s also gave rise to what is likely Hertel’s greatest contribution to Buffalo’s pop culture DNA. 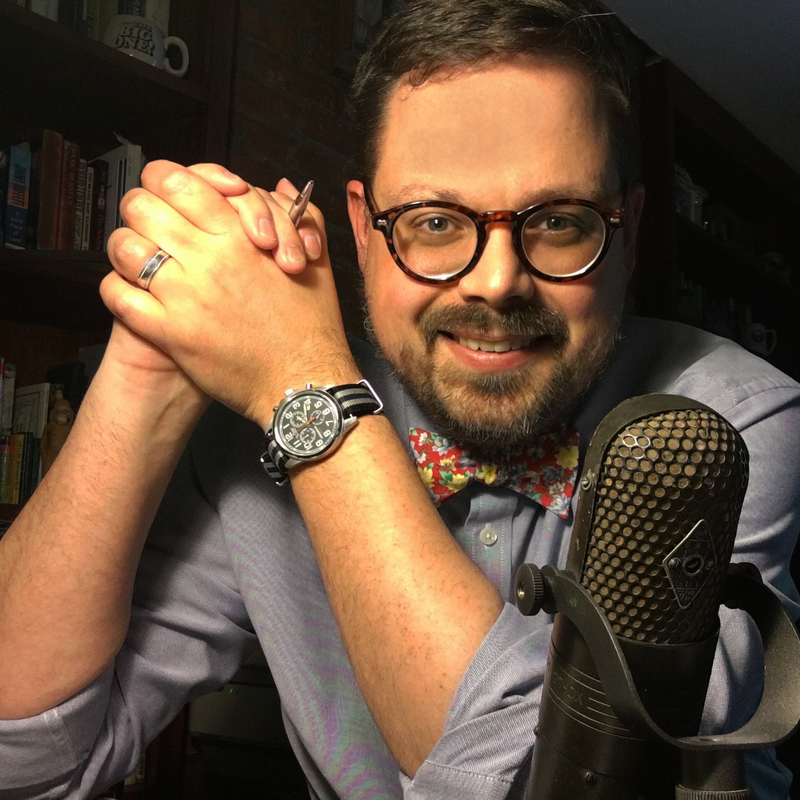 Accounts differ of the exact details, but most stories involve a bottle of tequila, a few Vietnam vets and a hankering for the tacos they’d grown up with in Chicago. 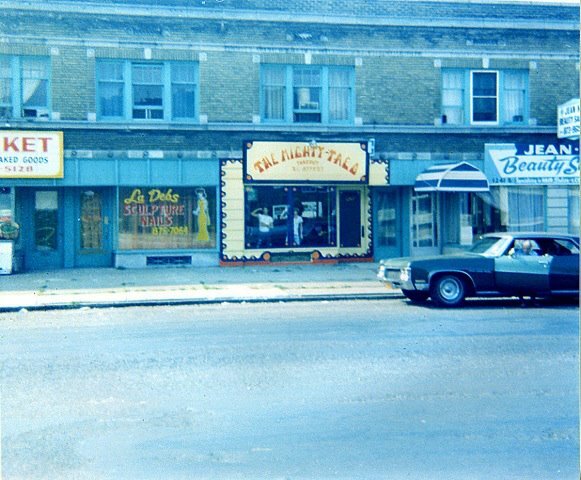 Four guys scraped together $6,000, and “The Mighty Taco” was born at 1247 Hertel Ave. in 1973. At first, Buffalo didn’t know what a taco was. 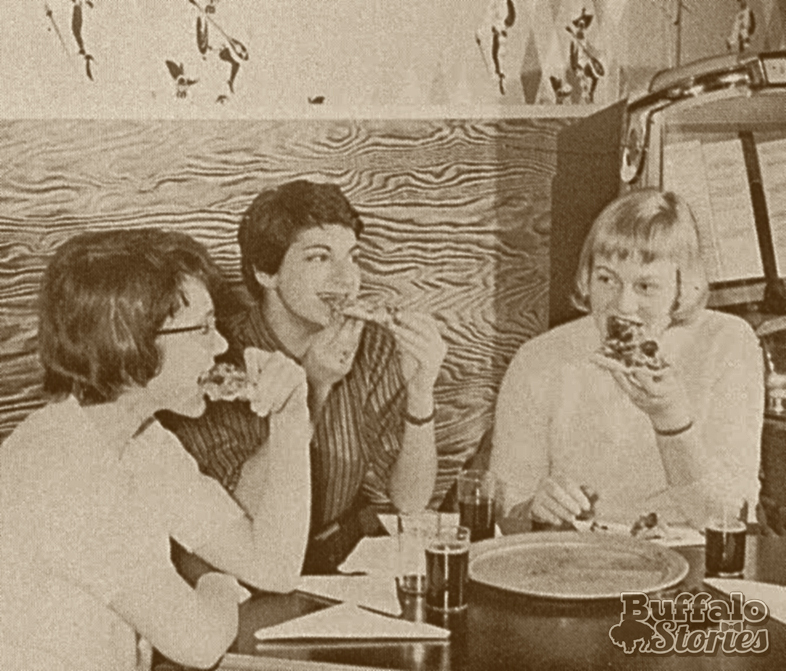 It was with the late-night college student crowd that those “Mexican sandwiches” first caught on, and by the end of the ’70s, Mighty Taco had four locations. The original Mighty Taco location moved off Hertel to nearby Delaware in 1994. But, just as we remember the Anchor Bar’s Main and North location as the first place chicken wings, hot sauce and butter were mixed, we should remember the original Mighty Taco storefront on Hertel near Commonwealth. 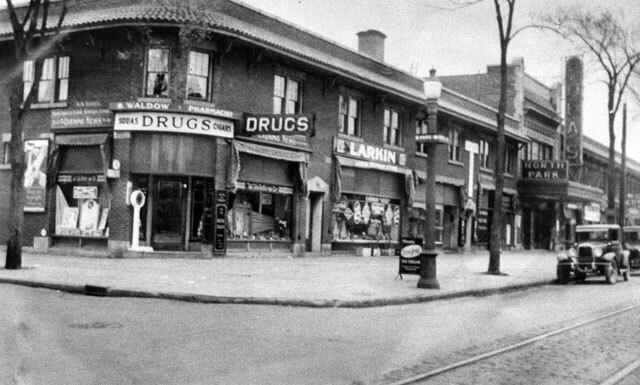 Perhaps the most wonderful part of the evolution of Hertel Avenue is the fact that it has been a true evolution. Many of Buffalo’s most exciting places have undergone more harsh makeovers to become the places we enjoy today. A walk through Larkin Square or along Chippewa, for example, would be an entirely foreign journey for someone familiar with the place half a century ago. Maybe just the buildings would be familiar. Not even the buildings give any clues to the past at the Medical Campus or Canalside, which have been rendered completed unidentifiable from past incarnations of those neighborhoods. Not so on Hertel. For all that’s new and exciting there, it’s pretty much the same place, though some changes do jump out. For example, the Sample Shop, which for decades brought more people to Hertel than perhaps everything else on the strip combined. The Sample’s first dresses were sold in the living room of a still-standing house just east of the Sample department store we all remember. That was in 1928. 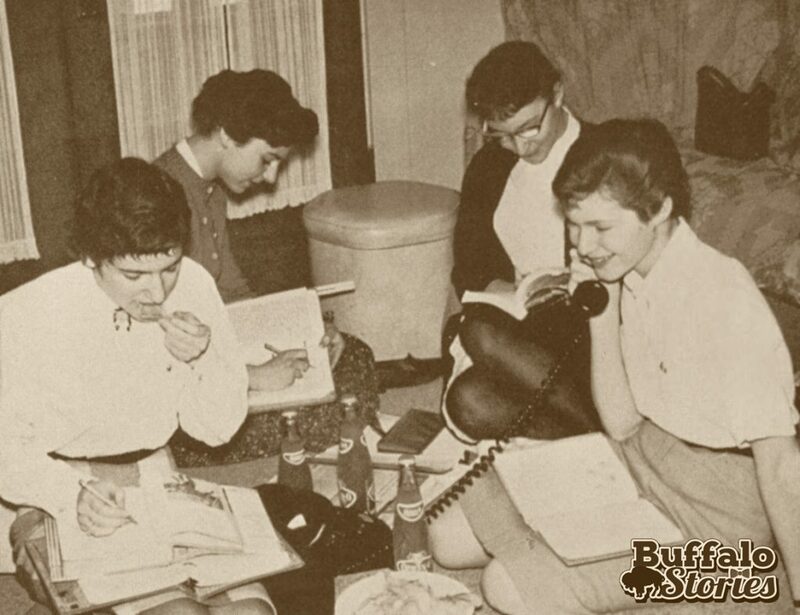 For decades afterward, thousands of women from all over Buffalo, attracted by the high fashion and unusual late evening hours, were seen stepping off the streetcar or bus at the corner of Parkside and Hertel in front of Sunshine’s Market (another victim of “progress”) to walk up the block to the Sample. On the corner of Hertel and Parker, an entirely different business operates today, but the feeling is the same as it ever was. 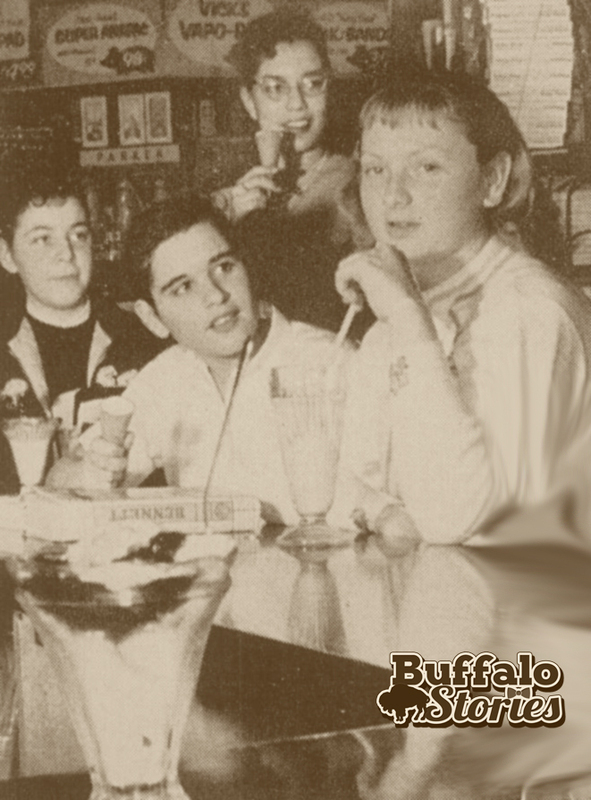 In the ’50s and ’60s, friends and neighbors gathered at the old Parker Pharmacy for a phosphate or an ice cream sundae. Today, people gather in the same building at what might be this decade’s version of the soda fountain: a coffee shop. It’s the same fellowship and conversation — we’ve just switched out the soda jerk for the barista and the 5-cent pop for a $5 latte. Some things just haven’t changed at all. There are plenty of restaurants and small shops where the faces behind the counter have been familiar ones for decades. A handful of bars have been in the same spot for generations, remaining real neighborhood joints as trends like disco and chocolate martinis come and go. 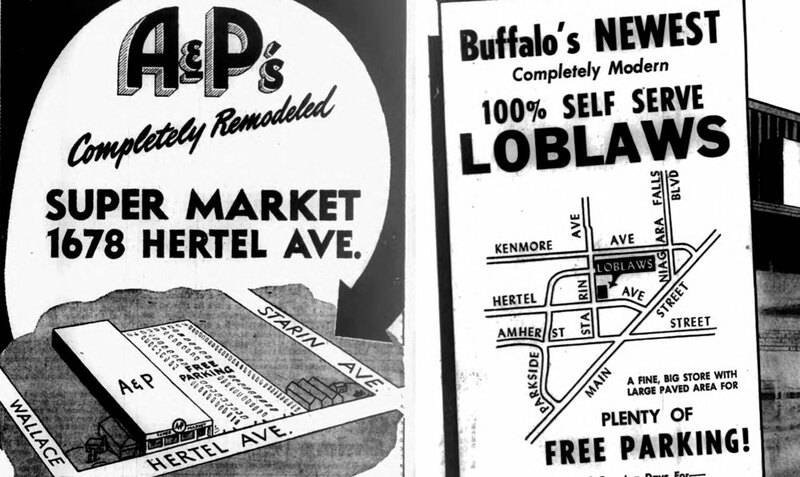 For just one example, look to a place North Buffalonians have been doing their banking on the corner of Hertel and Norwalk for more than 80 years. Hertel is a microcosm of the best version of “what’s next” for Buffalo — an eclectic, evolving, welcoming place characterized by the very best of what’s new woven into the fabric of what has always made our city great. 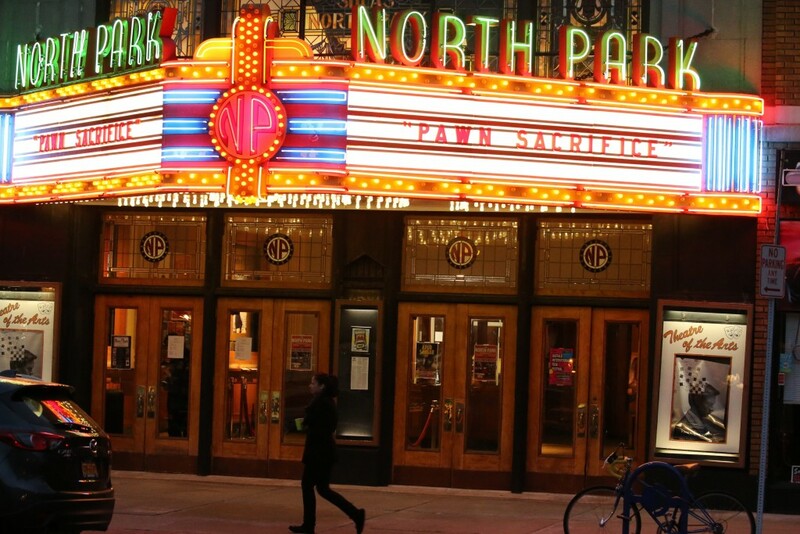 Since the gloom-filled announcement of the closing of Hertel Avenue’s North Park Theatre in 2013, new owners have been pumping tens of thousands of dollars into a full restoration of one of Buffalo’s few intact 1920s movie houses. Opened by Buffalo movie magnate Michael Shea in 1920, Shea’s North Park has been thrilling and entertaining moviegoers in North Buffalo for more than 95 years. 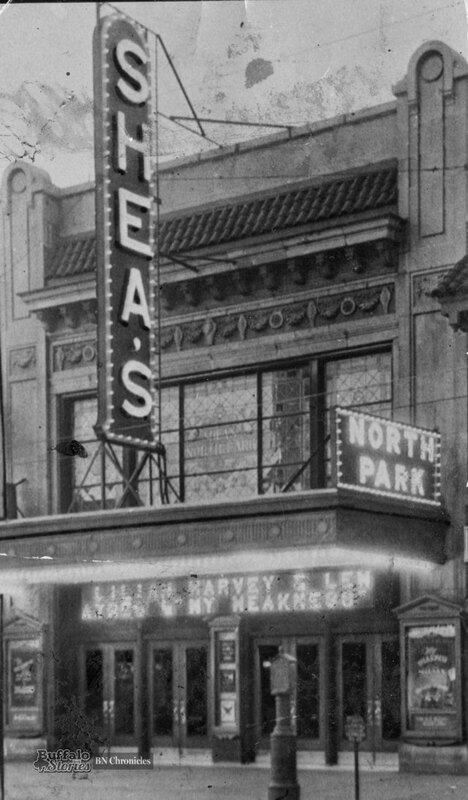 The image above, with a marquee promoting Lilian Harvey and Lew Ayres in “My Weakness,” probably dates from the year that film was produced: 1933.